As an student in STEM, I have done problem set after problem set based on ideal situations. It’s comforting to know that equations learned in class can be applied to these problems and lead to expected results, which are predetermined by the professor. For me, the most difficult homework problems to solve are not challenging due to the complicated equations. Instead, I have found that the most difficult are open-ended engineering design problems that have countless possible solutions. But these problems are also the most exciting to work through! They are technical problems that require a creative approach, and I have found that my first assumptions do not always hold true. These are the problems that engineers in industry face every day. There is a problem identified out in the world, and there is a need for a solution. This is when design thinking comes into play. Instead of assuming what problem needs solving and what solution will do just that, there should be time and effort dedicated to understanding the real needs and how those can be met. This is integral to the design process, which can be outlined in four steps by the double diamond model of design (developed by the British Design Council). An understanding of the context of the problem begins with research during the first phase: discover. Diverging from the initially identified problem can help determine what the real problem is and who is affected. Phase two defines the scope of the problem to be solved, given the priorities of who to solve for as well as the constraints of time and budget. The diamond pattern is then repeated by developing a wide range of prototypes to test and improve. Finally, a solution to the problem is delivered! But it doesn’t stop there! Almost every problem in STEM is dynamic and there is always room for improvement. The first solution is not always the best solution, so try it again! My biggest takeaway from learning the design process is too fail fast and iterate. I know that some of my designs may look good on paper, but the only way to find out if it will really work is to build, test, and learn. The design thinking mindset sets my focus on the big picture. There are a seemingly infinite number of technologies just waiting to be invented, but how many of those meet a real need? This question should be on the mind of every problem solver, no matter what age you are. Whether you are developing a new medical treatment or providing clean water to a growing population, try approaching the problem with a design thinking mindset. You may just end up with an innovative solution that you never would have thought of before. The gender gap in STEM is not just some statistical anomaly; it is something I witness every day. Even I had my own doubts about being an engineer, in part due to the fact that I never had a friend that shared my interests. Almost all of the girls I know have a negative attitude towards math and avoid any math-based sciences like Chemistry, Physics, and Computer Science. Most girls constantly tell themselves that they are just not a “math person” or a “science person” and therefore will never succeed in the subject. Girls’ cynicism towards STEM starts at a very early age, and our society and education system is at fault. The way math is taught in schools emphasizes speed and competition. Clubs like math team, while not inherently bad, deter many girls who are less competitive and more collaborative (which are exactly the kind of people we need in STEM). Math classes are often tedious, boring, and stress-inducing. Constant testing ensures that if you don’t understand even one concept, you will fall behind. In our current social and educational climate, I don’t blame most girls for not wanting to pursue STEM. However, one thing in particular sets me apart from the majority of my female peers. At the age of eight or nine, I was lucky enough to participate in a summer camp where we were able to take “classes” in math and science subjects that interested us. I fervently chose “Fun With Chemistry”, “Lego Robotics”, and “Building Computer Games With Scratch” (an introduction to computer science). I have no doubt that an early exposure to these subjects in a stress-free environment was how I developed a positive attitude towards STEM. Since then, my dream job fluctuated from chemist to video game designer to electrical engineer. Now, one day I hope to start my own tech startup. Organizations like MakerGirl are integral in cultivating a positive attitude in girls towards technical subjects. It is imperative that young girls experience STEM at least once in a collaborative, fun, and stress-free environment to open the path up for them to pursue it in the future. STEM is powerful, STEM is lucrative, and STEM makes change. STEM is exactly where we need the next generation of women to be. This quote is by Jameela Jamil, a British actress, model, presenter, and activist. Jamil fights for gender equality and isn’t afraid to be honest about where society needs to improve. MakerGirl is just one organization in a movement to decrease the gender gap in STEM fields. While the amount of girls encouraged to become scientists, engineers, leaders, mathematicians, and researchers is increasing, more work needs to be done. The next generation of female leaders won’t be considered ‘pretty’. This past February at MakerGirl, the HQ team brainstormed adjectives to describe a MakerGirl. The next generation of female leaders will be driven and headstrong. They will be respectful and reliable. Leaders are collaborative, creative, and hardworking. The next generation of female leaders are curious, ambitious, proactive, entrepreneurs. Something that has driven me in the past four years, and will continue to drive me through my adult life, is equality in education. I am a passionate believer that through public schooling, all children should receive the same quality of education and opportunity. This ideal has motivated countless hours of research, volunteer work, and brainstorming on how to bring opportunities to students in areas where education is underfunded. My sophomore year this lead me to MakerGirl. This past year, I was promoted to academies manager, the position I've dreamed about since first entering the nonprofit. My responsibility is bringing MakerGirl to other schools around the country, so that they can in turn bring resources to girls in the surrounding areas. This is a part of my life that excites me daily, and this summer I get to personally experience the joy of bringing resources to underfunded communities all across the east coast with our 3D printing road trip. Through MakerGirl, I get to bring STEM opportunity to girls not only in Urbana-Champaign, but across the country. I have the opportunity to not only inspire others to do so, but personally bring resources to the communities that I am passionate about serving. Bringing STEM to communities who don’t have these resources is important not only because of the learning aspect, but on a societal level it can potentially interest a student enough to break the poverty cycle that commonly occurs in lower income communities. Underfunded education leads to the racial inequality that continues to be prevalent in the systems of this country. Children who live in a low-income community will most likely go to an underfunded school, and therefore have less resources or opportunities than their peers just miles away. Bringing STEM resources to these communities shows them that they are allowed to have interest in STEM careers, they are represented in the STEM community, and even more, that the STEM community and academia want them. Students who are introduced to STEM at an early age are more likely to be able to thrive in the subjects through high school, and potentially higher education. In addition to developing an interest and knowledge base for STEM and enhanced inquiry skills, experts say that science instruction improves abilities in subjects outside of STEM, including literacy, language-learning, math, and executive functioning. However, if they lack the resources in their schools, they are again being deprived of an asset that better funded schools can provide. Equality in education is so important and even though society continually shows it’s low-income students that they are not deserving of it, it does not limit their ability to thrive and become successful scientists, teachers, businessmen, artists, or programmers. MakerGirl bringing its STEM resources to these communities will hopefully spark that idea of being a change maker in their community, and telling them that they can be whatever they want to be regardless of the amount of funding in their school. This is why I am excited everyday by the work that MakerGirl does, and why I believe that it is incredibly important to bring STEM to communities. Check out this article that explores why STEM education should begin in early childhood education. Since the fifth grade, I knew I wanted to be a vet. I grew up thinking I’d have a practice and imagined myself putting casts on dogs and making cats feel better. It was this career and the idea of helping animals that sparked my interest in science. Not long after, I got a microscope kit for my birthday that I was obsessed with for years. It came with prepared slides of different fibers and sample animal cells - I felt like such a scientist! The way science encouraged my curiosity helped me find my own answers to the questions I had and find new information on topics that interested me (usually animals) through what I would then consider “research” - picture books at my elementary school’s library. I followed this interest throughout high school and was persistent on my choice to become a vet because I still really wanted to help animals, but it wasn’t until after a year of being at my university that my perspective changed. I began to think through a more global lens and what I can do to help make the world a better place for both animals and people. I realized I didn’t like the medical field, so my inner scientist searched for different answers. My new motivation was in finding better ways to feed our production animals and pets while making a positive impact on our environment to ensure better futures for new generations. One of the most important things I’ve learned as a science student is that it’s not always about me - it’s about helping to cultivate a better future for people that I will never meet. The science route is difficult, but working through challenges and deriving a better understanding of who I am and my roll in the world has made my choice to work in STEM that much more worth it for me. With STEM/STEAM being a popular topic of conversation these days, especially as it relates to kids, it’s no surprise that there are tons of apps, toys, and websites out there that promote STEM/STEAM learning. Here are some of our favorites! Designed by our friends at The Inventery, Inc. for all ages and skill levels, the Morphi app combines the fields of 3D modeling, 3D printing, and AR. The applications are truly endless, use it for everything from simple creative endeavors and 3D design to animation and product design. It is an excellent tool for classrooms and individuals alike and as an added bonus you don’t sign up for an account or even need Wi-Fi! One of our personal favorites, Tinkercad is a free 3D design website for all ages and skill levels. It offers several tools including a new design-with-code option called Codeblocks. With tons of tutorials and educator resources, it is a great tool for classrooms but can also be used for tinkering at home. Plus you never have to download any software! The brain-child of the Lifelong Kindergarten Group at MIT Media Lab, Scratch is a free website that encourages kids to think creatively and systematically as they design projects such as games and animations through simple block coding. With plenty of tutorials and guides, there is no experience necessary to begin. Plus it’s free! As seen on Shark Tank, Toybox is a small 3D printer that allows you to print toys from the comfort of your home. With options to browse through a library of designs or create your own, the options are seriously endless. Don’t let the word “toy” mislead you, Toybox is fun for all ages! Makey Makey is essentially a keyboard that turns anything that conducts electricity (think bananas, Play-Doh, and tinfoil) into an interactive touch pad. Create cardboard arcade games, interactive art museums, banana pianos, and so much more! It is super simple to use and it can even be used with water! This weekend I attended South by Southwest (SXSW) on behalf of my team. Since joining the organization in the summer of 2017, I have experienced so many amazing opportunities including the chance to visit Austin, TX. I spent most of my time at The Female Quotient Lounge where I heard many different panelists discuss topics regarding women and girls. The panel that stuck with me the most was Investing in Girls to Grow the Next Generation of Leaders as it questioned the original meaning I associated with the word empower. There have been a few times over my past couple of years with MakerGirl that I had used this term to describe our work. Whether that be “we empower girls to be active in STEM fields” or that we are a group that “empowers the girls of the future”. Anna Blue, Co-Executive Director of Girl Up, made a statement about not liking the term “empower” as it means you are giving the power to someone. Girls do not need to be empowered; they already have the power. This statement struck me as I had talked to other team members before about the word and whether it is a strong or weak adjective to describe our work. We do not need to be empowering girls to create, build, or lead the future; we need to continue to show them that they already have that power and give them the opportunities to use it. I think everyone needs to be reminded of this. Many organizations are doing amazing work every day to help girls and women unleash their power in different parts of their lives. We need to show everyone that these organizations are not giving them this power, they are simply allowing a space or giving tools to help use that power. MakerGirl sessions are one of these opportunities for young girls to use their power and to learn about STEM. We have been exchanging out the term “empower” with “educate” as that is what we are actually doing. We teach young girls about simple CAD design and let them use their power to create their own custom 3D printed object. This weekend not only changed my idea of the term “empower”, but also introduced me to many different women who are using their power in different ways. Hearing from panelists such as Maxine Marcus, founder of The Ambassadors Company which she started in high school, left me in awe that a teenager created her own (very successful) company and is continuing to use her power during her time in college. There were many other amazing women I got to meet, and I am so honored that MakerGirl let me attend SXSW on our behalf. Ladies, how are you using your power? Growing up, one of my favorite activities was going to a store with my aunts in St. Louis called Made By Me. We spent hours at this craft shop prepping my notebooks for the next school year or cutting and pasting magazine clippings to turn into a customized purse or gifts for my friends. The items were sentimental because they included pictures of role model athletes and celebrities, inspiring quotes, and pictures of places I would want to vacation to, somewhat like a vision board. Every single time, I confidently wore that purse to movie dates with my family or proudly displayed the fact that my school notebooks were unique. It was also special to go with my creative, cool aunts who I only saw once in a great while. My experiences at Made By Me—to this day— stand out in my childhood. Not only did I get to spend hours on hours of “play” time with my aunts in a creative environment, but I was given and received confidence while my aunts and I would gush over the pieces that we had created together. After sending Made By Me gifts to a long-distance friend and hearing her burst with joy, I was shown how giving is better than receiving. It didn’t matter if the items created were a little mod podge messy, what mattered is that I left Made By Me with a treasured experience in which I learned the power of creative confidence and generosity. The power of making still resonates with me today, 20 years later, because of my Made By Me experience. 1. They don’t think STEM is creative. 2. They don’t think they can make an impact with STEM. I immediately thought of my Made By Me experience because it solves both of these gaps--creativity for obvious reasons and crafting products that I would actually use showed me that I can have an impact. I chose 3D printing as the experience because girls can act like architects when crafting items on TinkerCad, and be proud to show off their 3D printed items at the end, just like I had while crafting my purses and notebooks. I look back and realize that it is this experience that instilled a “maker mindset” within me. A “maker mindset,” as defined by MakerGirl, is one that allows girls (and boys) to say “yes to the challenges of the future”. It enabled me to understand that I have the power to make beautiful ideas come to life. Confidence: For someone with a maker mindset, it’s not about “if” I will built it, it’s about “how.” I still have confidence in my ability to make cards and send them to my friends, even if I have no formal art training. That’s because of my “Made By Me” experience. Positivity / Happiness: When you have a maker mindset, challenges aren’t frustrating obstacles, but rather opportunities to learn and think creatively. For example, one morning, I was annoyed when my computer wouldn’t start to take notes for my sales call, so I ended up doodling the notes instead. I know it sounds cheesy, but this creative exercise made my morning memorable and fun! Teamwork: People with maker mindsets are confident in their strengths and admit to their flaws. They see team projects as opportunities to bring out the best in people and learn from others. A maker mindset takes out the ego that can often get in the way of effective teamwork. This model allows for rapid prototyping. Rapid prototyping makes it easier to overcome tomorrow’s challenges. Solving worthy problems in challenging industries starts with a maker mindset because it allows one to think big by starting with baby steps. Get involved in the social community of making: Attend local Maker Faire events, where you can learn about cutting-edge technology toys like Ultimaker, Raspberry Pi, and Arduino kits. Ensure time is set aside for play: Whether it be cooking a new recipe, making a card for a loved one, etc. Prioritize one play activity per week to ensure your mind has time to wander and explore. Bring fellow makers (a'hem, everyone) into the conversation: Always ask for feedback because self-improvement is never complete. One of my favorite questions is, “Tell me on thing I don’t want to hear.” It gives the other person space to say one thing she/he might not have brought up before. The question allows for honesty and creativity into seeing another person’s perspective. I can’t imagine how limitless the responses would be from kids when asking for their constructive feedback. I define myself as a maker because I was affirmed of that as a child and still practice it as an adult. In building MakerGirl, I’m always trying to to innovate and in my full-time role LinkedIn, I’m eager to create new ways of connecting with my team and the thousands of nonprofits I serve. With experiences like Made By Me and now MakerGirl, we are creating makers who will transform their communities and world. I’d love to learn from you. In what ways have you? Found little or sizable ways to encourage your community of makers? On January 15th of last year, my soon-to-be co-director Amanda and I walked into a Whole Foods in Chicago and were greeted with a hug by MakerGirl co-founder Lizzy Engele for the first time. At the time, I had only heard about MakerGirl from a contact in Northwestern’s SWE chapter, and had obtained cursory knowledge from browsing the website – not much, but enough for me to see the great things MakerGirl was accomplishing. My goal in setting up a meeting with Lizzy was simply to gauge how Northwestern students could get involved helping out at MakerGirl sessions. Our future partnership was a vague, far-off idea and the concept of forming our own academy was something I had barely considered. Hearing Lizzy talk about MakerGirl and its mission was a turning point for me – her passion for this organization and its impact was captivating. That two college students founded this organization which has grown so much in just a few years seemed impossible. Now, just one eventful year after that first meeting, it’s crazy to see how far the Northwestern Academy has come. In 2018, we built a network from scratch of Evanston and Chicago area schools, libraries, and parent associations, and had opportunities to partner with other established organizations doing great work with kids, such as Codeverse and the Girl Scouts. We laid the foundation of our new academy, built a team of 12 brilliant female university students, and organized four successful sessions. And for me, MakerGirl was the most defining experience of my final year in college. Last December, I finished my time at Northwestern. As sad as it is to step back from my role in MakerGirl, I know I’m leaving it in great hands. I’ve loved working so closely with my amazing co-directors, Rika and Amanda, and the rest of our Northwestern team, and I can’t thank them enough for the journey and accomplishments we’ve achieved together. The past year was a whirlwind of scheduling meetings and attending conference calls, recruiting team members and working out session logistics. It was exhausting at times, but every session we held was the only reminder I needed for why we do what we do. The elementary school girls who attended had an excitement for designing and creating that is so easy for us college students to forget. At that age, curiosity and creativity come so naturally to kids, and they’re free to learn without worrying about limitations – I could see that in the way they were so focused working with TinkerCAD or watching the prints. Girls who were shy at the beginning of a session became animated and talkative within an hour, and every girl who attended left happy. I joined MakerGirl because as a computer science student, I was already starting to see what it was like to work in an overwhelmingly male-dominated industry. As I move forward and move on to work in the tech industry, it’s comforting to know that there are bright young girls out there being exposed to STEM and being given access to mentorship from the strong and ambitious women I’ve met through MakerGirl. The perfect stocking stuffer for your budding scientist, this crystal growing kit contains everything you need to grow crystals at home! Watch as your crystals form, change, and grow over several days. Available in a variety of colors. The Circuit Scribe Basic Maker Kit teaches your little scientist about circuits and conductivity using a touch-sensitive pen and lights! The kit includes 27 pages of modules and lessons and is the perfect combination of art and science. Looking for a book about science, girl power, and perseverance? Look no further than Andrea Beaty’s Ada Twist, Scientist! Inspired by real-life scientists, this book emphasizes the importance of asking “why?”. Learn about solar technology with the Solar-Powered Bug Kit! Powered by the sun or a non-fluorescent light, this grasshopper-sized robot wiggles and lights up when charged. The perfect gift to teach your technology enthusiast about alternative energy sources. Enter the world of Harry Potter and create magic with the Kano Harry Potter Coding Kit! The kit comes with everything needed for your young wizard to build and code their very own wand. Step by step guides and the free Kano app bring the magic to life! A tribute to the tinkerer and inventor in all of us, Doll-E 1.0 follows Charlotte as she uses her skills to re-engineer her doll. Emphasizing the importance of open-mindedness and play, this is the perfect book for the young and curious technologist in your life. Allow your little engineer to pave the way with a roll of Civil Engineer Tape. Engineer roads, highways, intersections and more with this fun roll of tape. Designed for matchbox-sized cars, this small gift is perfect for fostering imaginative play. Looking for the perfect building toy? Look no further than STAX! 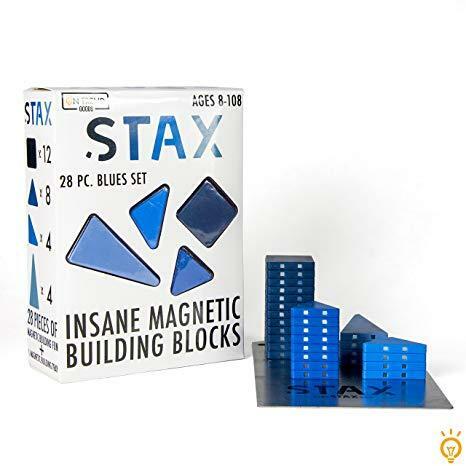 These insane magnetic building blocks are fun for kids and adults alike and it comes with a magnetic building plate to build and fidget on the go. Check out the wide variety of colors, from blues and greens to pinks and reds. 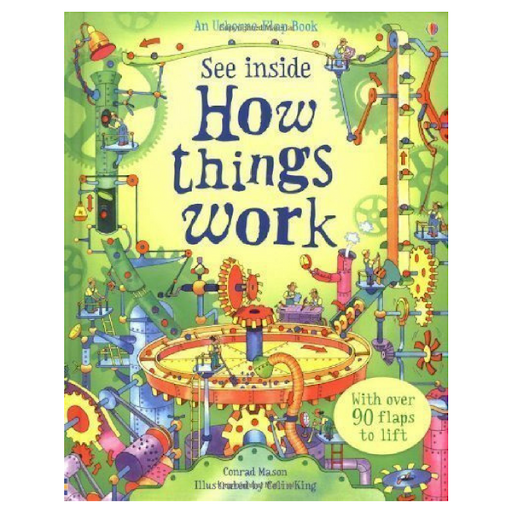 This interactive lift-the-flap book is filled with factual information about real machines, gadgets and inventions. It even includes links to websites with supplemental games and experiments. Perfect for your budding engineer! The classic Rubik’s puzzle, now in a working key chain! Clip it on a backpack or tuck it in your pocket for puzzle-solving on the go. 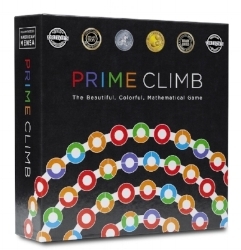 Part strategy game, part math game, Prime Climb is perfect for math-lovers, both kids and adults alike! The color coding system makes multiplication and division quick and easy to learn, all while teaching about prime numbers. Go behind the scenes of the Apollo 13 moon landing and meet Katherine Johnson, the mastermind mathematician behind the success of the mission. Inspiring, engaging and informative, this book will introduce your child to their new favorite STEM role model.